Next month will see the opening of a special Star Wars exhibition entitled Identities. The events will be taking place this spring and fall in Canada and to help promote the event, this series of mosaics depicting key figures from the movie series have been created. 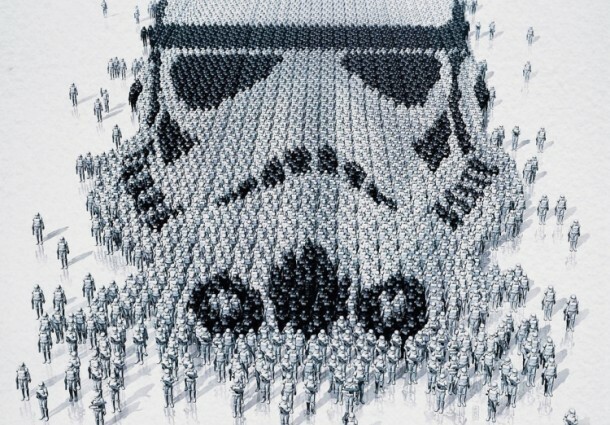 via: highsnobiety.comIl prossimo mese sarà innaugurata una mostra speciale dal titolo Star Wars Identities. Gli eventi si svolgeranno in primavera e in autunno in Canada e per promuovere l’evento, sono stati creati questa serie di mosaici raffiguranti le figure chiave della serie. What i don’t realize is in fact how you are not really a lot more neatly-preferred than you might be now. You are so intelligent. You understand thus considerably when it comes to this matter, produced me personally consider it from a lot of various angles. Its like men and women aren’t fascinated unless it is something to accomplish with Girl gaga! Your individual stuffs great. Always maintain it up! Hiya, I am really glad I have found this info. Today bloggers publish only about gossips and web and this is actually irritating. A good site with interesting content, this is what I need. Thank you for keeping this website, I will be visiting it. Do you do newsletters? Can not find it. I¡¦ll right away take hold of your rss feed as I can not to find your e-mail subscription link or newsletter service. Do you’ve any? Please permit me realize in order that I may just subscribe. Thanks. cjmxrhe,Hi there, just wanted to say, I liked this article. It was helpful. Keep on posting! pkwsbg Yeezy Boost 350,This website truly has alll of the information and facts I wanted about this subject and didn?t know who to ask. There are hundreds of blog sites that calls for discuss them. What is the objective of blog site remarks? Howdy very nice web site!! Man .. Beautiful .. Superb .. I will bookmark your web site and take the feeds additionally¡KI’m happy to search out so many useful info here in the put up, we want develop more techniques in this regard, thank you for sharing. . . . . .
Hello very nice site!! Man .. Beautiful .. Amazing .. I’ll bookmark your blog and take the feeds also¡KI am satisfied to find numerous helpful information here in the put up, we want work out extra strategies in this regard, thank you for sharing. . . . . . I enjoy you because of all of the labor on this blog. Gloria delights in working on investigations and it’s really easy to understand why. Most people know all about the lively means you make very helpful items via this website and foster response from visitors about this concept then my princess is really being taught a lot of things. Take pleasure in the remaining portion of the new year. You have been conducting a brilliant job. What i do not realize is in truth how you are not really much more neatly-preferred than you might be right now. You are so intelligent. You know thus considerably when it comes to this subject, produced me individually consider it from a lot of various angles. Its like women and men are not involved until it is one thing to accomplish with Woman gaga! Your individual stuffs nice. All the time maintain it up! My spouse and i were really fulfilled that Jordan could complete his research from the ideas he had while using the blog. It is now and again perplexing to simply always be giving for free guidelines which usually some other people may have been trying to sell. And now we figure out we have the blog owner to give thanks to because of that. All the explanations you’ve made, the straightforward website menu, the friendships you will help promote – it’s got all spectacular, and it is helping our son and the family believe that that subject matter is enjoyable, and that’s quite fundamental. Many thanks for the whole lot! What is a great free blogging web site that I can reply to blog sites and others will react to me?